Lot 49 C/I Wagon Registration Plate. 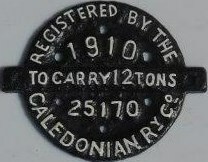 "CALEDONIAN RY CO - 25170 - 1910 TO CARRY 12 TONS". Front restored.